Amid low public expectations, Japan’s newest and largest opposition party conducted its inauguration ceremony Sunday, vowing to dethrone Prime Minister Shinzo Abe’s ruling Liberal Democratic Party. Sunday’s formation of the Democratic Party, born from the merger of the Democratic Party of Japan and Ishin no To (Japan Innovation Party), represents the culmination of opposition efforts to unite against the LDP-Komeito ruling coalition in the critical Upper House election this summer. The party’s platform, however, is basically the same as the former DPJ’s in terms of political philosophy and policies. Whether the opposition force can attract more voters remains to be seen, despite the flashy rhetoric used at Sunday’s convention. “Today is a historic day. We must put a stop to the uncontrollable Abe administration, under which people’s rights to free expression, access to information and pacifism declared by the Constitution are all in peril,” said Democratic Party President Katsuya Okada, who formerly led the DPJ. “The DP is the last chance we’ve got to unseat” the LDP, he said. 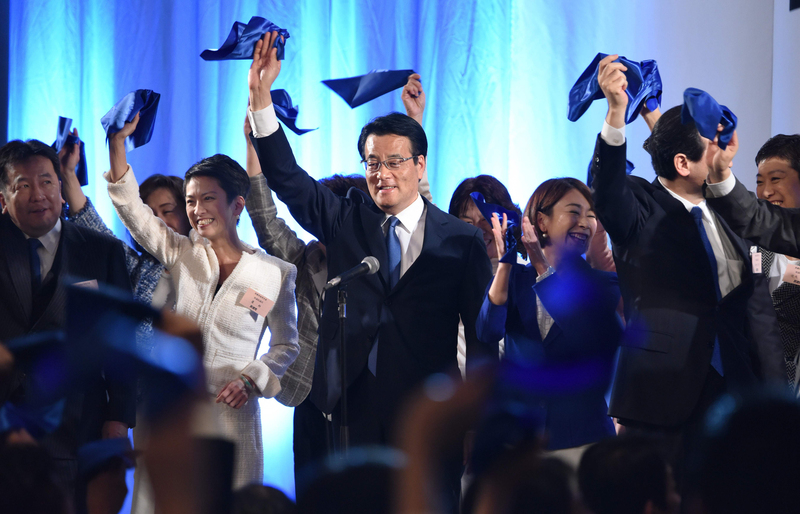 The DP boasts 156 seats combined in both the upper and lower chambers, but that is still far short of the number held by the ruling coalition, which has a two-thirds majority in the 475-seat Lower House and a majority in 242-seat Upper House. The DP’s Japanese name is Minshin To, which can be literally translated as Democratic Progressive Party. The rebranding ended the nearly 20-year history of the Minshuto, or the DPJ. At the convention, Okada was elected the DP’s first president, where he then appointed Kenji Eda from Ishin no To and former DPJ members Akira Nagatsuma and Renho — who only goes by one name — as his vice presidents. He also tapped DPJ lawmakers Yukio Edano and Shiori Yamao to be secretary-general and policy chief, respectively. The surprise appointment of junior lawmaker Yamao as policy chief has underlined the party’s wish to emphasize a new look and freshness to overcome lingering public disenchantment with the DPJ during its first three-year stint in power from 2009 to 2012. A former prosecutor and childhood actress who won the lead role in the musical “Annie,” Yamao, 41, has shot to fame in the Diet this year for her persistent quizzing of Abe on welfare issues, such as the shortage of day-care centers and the low salaries of female part-timer workers. She also has a 4-year-old son. But aside from its expanded size and Yamao’s high profile, the DP appears as if it has made no significant changes to differentiate itself from the former DPJ, observers said. 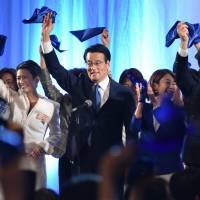 Many Ishin no To lawmakers who joined the new party Sunday used to be DPJ members themselves. The lack of freshness apparently has translated into lackluster public expectations, with an opinion poll last week by Fuji News Network showing 68.6 percent of the public unimpressed by the merger. The new policy platform adopted Sunday suggests a lack of novelty, as well. It smacks strongly of the DPJ’s traditional philosophy and repeats a raft of well-known policies, including the need to protect democracy, boost diversity, contribute to world peace and promote prosperity. The center-left DPJ was long split by right-leaning lawmakers calling for revising the war-renouncing Constitution, and left-leaning members who oppose the move. And like the DPJ, the new party says it will be a crusader for “consumers, taxpayers and workers,” a repeat of the DPJ’s long-standing promise to champion the middle class, whom it claims to represent. Although former DPJ members will likely dominate the new party , the “innovative” ethos of Ishin no To must not be lost, said former President Yorihisa Matsuno after his party officially disbanded Sunday morning. “I hope the new party will carry through on some of our key policies such as elimination of tax revenue waste and bold self-sacrifices” on the part of politicians, he said. Such signature Ishin no To policies were also written into the new platform. In response to the inauguration of the new party , Jun Iio, a professor of political science at the National Graduate Institute for Policy Studies in Tokyo, said Sunday’s merger will herald no drastic shift in Japan’s political dynamic for now. “At this point, no drastic improvement can be expected of the way the public views the new party,” Iio said. The professor, however, added that the move at least sends out a positive message that the nation’s opposition forces, previously fraught with intra-party fighting, are finally coming together and may spark change in the long run. The party’s success, Iio said, hinges on whether it can map out convincing policies in areas such as the economy and social security. To carry through on its pledge to mitigate disparities, a DPJ panel tasked with promoting “coexistence” on Tuesday adopted 11 key proposals likely to serve as a linchpin of the DP’s campaign policy as it prepares for the Upper House election. Those included phasing out fixed-term employment, raising minimum wage standards and increasing monthly child-rearing allowances regarding the second and third child to ¥10,000 from the current ¥5,000 and ¥3,000, respectively. The panel also proposed introducing scholarships for financially struggling university students, as opposed to the current student loan system.